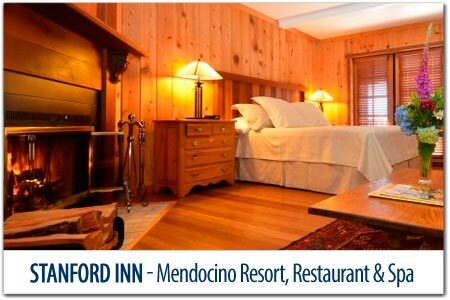 STANFORD INN & SPA RESORTOffering superior rooms, with wood burning fireplaces, panoramic views of the ocean, our gardens and the village of Mendocino, enclosed year-round pool, sauna and spa, kayak, canoe and bicycle rentals plus a complimentary gourmet breakfast cooked to order. This B&Bs cottages are perched within beautifully landscaped flower gardens on a hill overlooking the sea. All of the suites have spectacular panoramic ocean views of waves crashing on the rocks below. This Historic 1860 B&Bs farmhouse and cottages sprawl across 8 acres of gardens, meadows and forest with ocean views, fireplaces, hot tub and beach access. They also offer two oceanfront cottages with spectacular views, just down the road. FROMMERS GUIDE said - "Words can barely convey the almost surreal splendor of the view from this B&Bs front lawn, a sweeping unfettered vista of the sea and its surging waves crashing onto the dramatic bluffs"